Some games are worthy of a re-release or a remake. The Last of Us, DmC and Grand Theft Auto V were all recent enough to merit graphically improved iterations a year or so on, while titles like Homeworld and Abe’s Oddysee are classics that deserve the full remake attention. 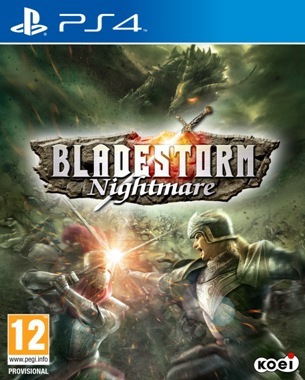 Bladestorm: Nightmare doesn’t fit into either camp however, and that means it’s difficult to see the point of it. 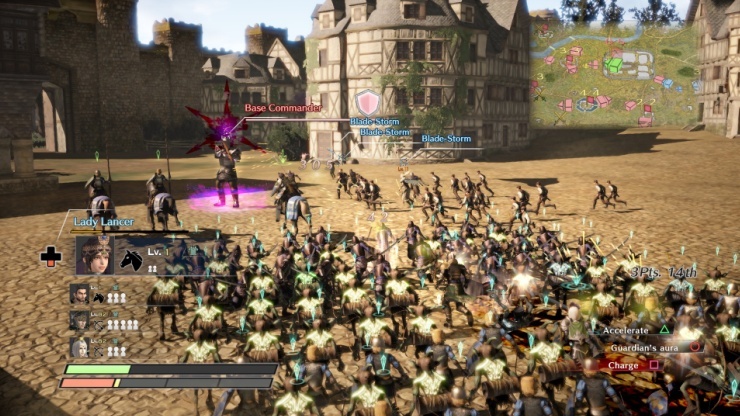 Bladestorm: The Hundred Years War originally came out in 2007 on PS3 and 360. 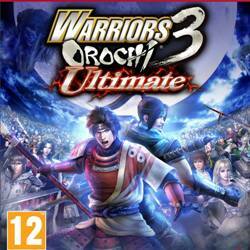 Borrowing heavily from the Warriors franchise, you set about capturing bases on scaled-down regions of France, but where Koei’s other series have you playing as an uber-powerful lone wolf, here you will only impact a battle if you join up with a squad. 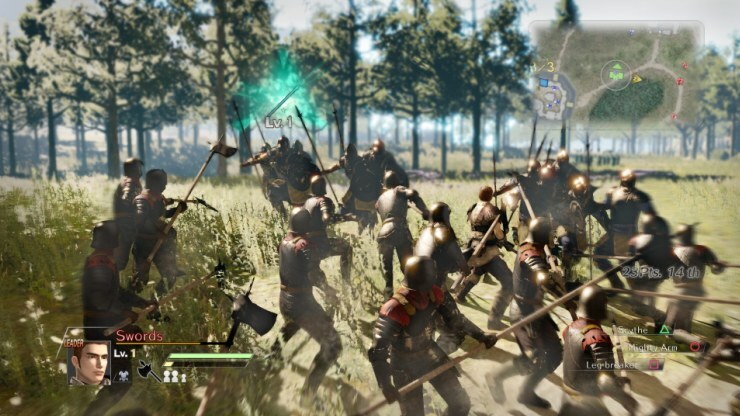 The core combat is fun enough, and you can switch between units on the fly – controlling archers one minute, then mounting up to lead a cavalry charge – keeping things interesting, with the whole package wrapped up in the story of a mercenary during the war, meaning you can choose which side to fight on for most battles. Sure, the original had issues, but it was thoroughly enjoyable. 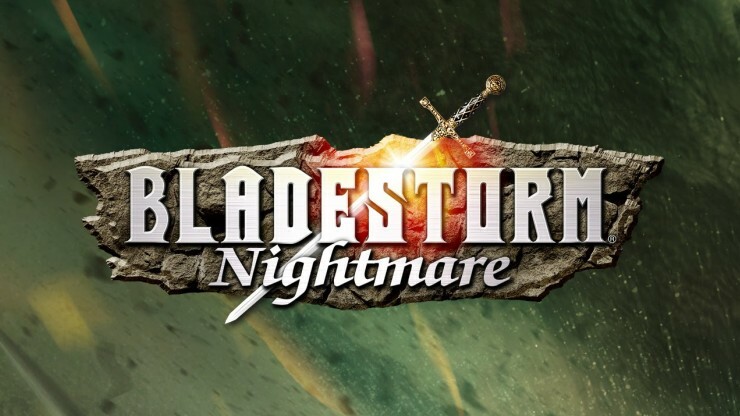 So when Bladestorm: Nightmare was announced I was quite excited; time had softened the issues I remember the original having, and surely a sequel would fix them. It was only when I booted up the review code that I realised what Nightmare was not a sequel, nor even a remaster, but a port of an eight-year-old game, albeit one with a new campaign grafted on. Let’s deal with the new stuff first. 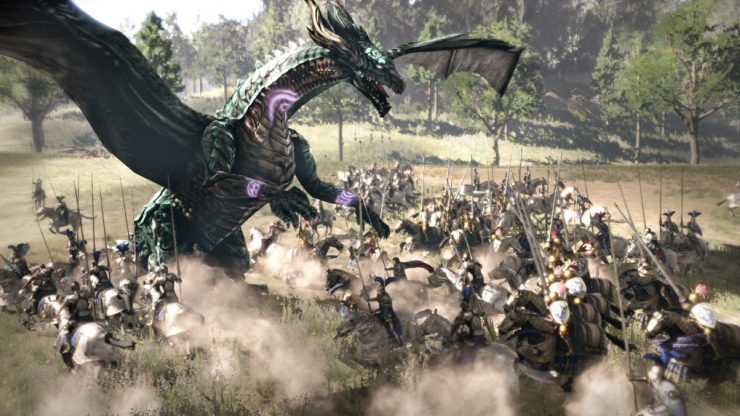 In the Nightmare campaign, the war between England and France has been interrupted by the appearance of magical creatures, forcing the once-enemies to ally against the new threat. Gameplay remains the same, tasking you with capturing bases and defeating opposing heroes. It’s actually an improvement on The Hundred Years War campaign as, despite their linearity, the missions themselves are more multistage; once you tackle a base the enemy might launch a counterattack, which you have to repel before advancing again. It keeps you on your toes, and as you progress you get to take charge of magical units, replacing your horse with a griffon, for example, or leading a squad of grim reapers. The kicker though, is that you really need to put at least a few hours into the main campaign before touching the new stuff. 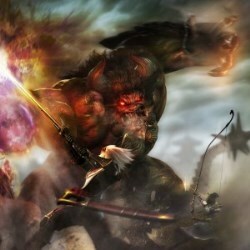 Technically you don’t – you can plough through the first Nightmare mission easy enough, until you reach the ‘Boss’ hero at the end, who is a level 39 swordsman. Your character is transferable between the two campaigns, so levelling them up in one means they gain the skills in the other, but it’ll take at least five hours to raise one of your unit levels – you have them for every type of unit – high enough to take on that boss. Nightmare all but forces you to play the original campaign, and it’s here that Bladestorm shows its age, and the issues that have been allowed to fester for eight years are a bigger problem. Gameplay is as enjoyable as ever, at least. The unit you’re leading acts as an extension of your character, lining up in formation either side of you, moving and attacking as one. Your basic attack is the right shoulder button, with special moves such as charge or shield bash mapped to the face buttons. Armed with these you run around the battlefield capturing bases, with the battle ending when you capture the base demanded by your objective, or the timer runs out; non-story battles must be completed within a certain amount of days, each 10 minutes long. Capturing a base means defeating a certain number of regular units marked with a shield before taking on the base commander that appears. The first problems appear in the unit choice. Each squad has their own strengths and weaknesses – swordsmen beat archers, archers beat cavalry, cavalry beat swordsmen, etc – but foot soldiers are far too slow. While the maps are scaled down regions of France, it can still take a few minutes to get from one base to the next on foot, problematic if you only have 10 minutes to reach your objective several bases along the chain. Even worse is reacting to your side losing a base elsewhere; if your objective is to defend one base and capture another it’s a difficult juggling act. The answer is to just control cavalry. Leading a charge of 40 armed men and horses is great fun, but when that’s all you do it can get repetitive, and if you come up against a high-level squad of something strong against cavalry, you’re screwed. Being able to control several heroes on the battlefield, switching between them on the fly, should mean you can counter any threat, but as the only help is foot soldiers you’re back to square one. Repetitiveness extends to the campaign as well. You pick up missions from a tavern, selecting which battles to fight in. Story missions are compulsory, and they’re unlocked by raising your Fame. Doing this means dropping into skirmishes in one of the regions. Like most side-missions these are just the same thing, over and over, on a slightly different map, but the amount of them you have to do between main missions is ridiculous. Still, the core gameplay is fun enough even if it is repetitive – what Omega Force game isn’t? 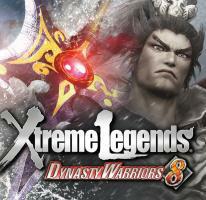 – and the squad based action provides a different type of challenge to the Musou fighting games. But bloody hell, the presentation is bad, and the voice acting is appalling. In the original campaign the English voices just seem daft, while the French ones are presumably based on clips of ‘Allo ‘Allo!, and poorly at that. The Nightmare campaign is a little better, but overall it’s comedic when it isn’t meant to be. 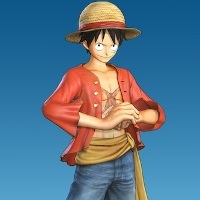 The graphic’s pale in comparison to the voice acting however. The original drew flack for looking out-dated back in 2007, and they haven’t improved it in any discernable manner here. Not at all. The primary colour is brown, which is fair enough for 14th Century France, but it is just boring to look at while textures themselves are muddy and a little blurry. Again, the new campaign is a bit better, with some bright florescent colours added in for spells and the like, but it still isn’t great. Graphics aren’t everything, but after eight years you’d think they’d have done something to improve them. 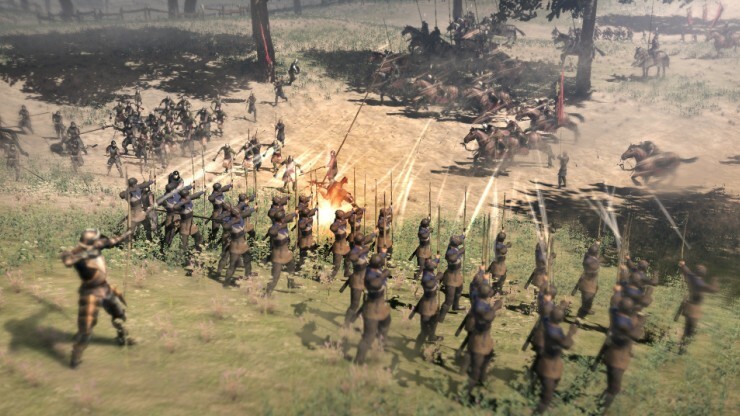 Bladestorm: Nightmare is best in incredibly small doses, a battle or two everyday – which is an issue when the base campaign is over 50 hours long. It can be fun, but why Omega Force didn’t make a sequel, or even just improve the looks, is beyond me. Instead their mediocre eight-year-old game has to stand shoulder to shoulder with the library of titles on PS4 and Xbox One, and it simply can’t match that. If you’re interested, you may as well just grab a cheap copy of the original from a bargain bin. 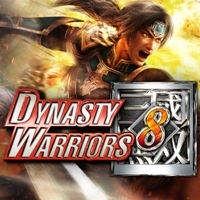 A mediocre eight-year-old game judged by modern standards.